I guess it won't be a problem video wise if the file was a MP4 which is what I use. If its a DRM movie, put it into Handbrake and make a DRM Free copy :) I think seriously, it's too much to ask for B&O to make this as software from them is a complete nightmare - look at the Moment thread - 18months on! The world of HiFi just seems to be even more unstable each year. It's safer to make great loudspeakers. When you purchase music, books, or movies in electronic form providers such as iTunes, Amazon, or others, you agree to the EULA or End User License Agreement. This means that you actually have purchased a license to use that content as much as you want but you do not own it. This is US federal law but the terms of the EULA are most likely different in other countries. It is usually the same with software. I like vinyl LPs too. it appears reel to reel tape is making a return. At the Munich show, it was announced that Revox will be selling a reel to reel tape player. No price was quoted. I have my limits. It will be interesting to see what happens. My hope is that Bang and Olufsen survives. However there is a lot of change coming. WOW Linder brings back memories of the Redox B77. My friend had one, it was amazing!!! A real work of art! But in context of the streaming paradigm, you may not "own" the downloaded song but you get to keep it if the provider goes out of business. I don't think that the provider is able to take away your downloaded file because of some event. I have never actually read a EULA but I think the intent is to keep you from giving the download away to all your friends, potentially taking away revenue. There are no EULA's for ripped CD's, but I'm sure the same limitations apply. I am not against streaming services, for me it would be a great way to discover new music. If I like it enough I will buy the CD and directly support the artist (and label). With subscription services I am supporting every artist in general and not supporting the artists I like the most. I guess in turn that some of Taylor Swift's royalties would go to Rinne Yoshida! Don't forget that CD´s and other kinds of media usually fails with time. And that you need a clumsy player to play them back. Those units did a good job but now time has passed and CD´s aren't really practical anymore. The earth is getting crowded, and the planet are suffering because of our wasteland of old stuff and crap. Going digital eases this problem. Just imagine all the CDs, DVDs, VHS-tapes etc that isn't being thrown out every day anymore. I think we will see a variety of solutions over the coming years while consumers and industries experiment with different solutions and when we see how we like it best. Another thing that is equally important is how the music industry has been transformed completely with the introduction of computers and other technology that makes it easy for people to create music, and do it quite professionally - without expensive studios, labels or such. This means more music are pushed out on the market, so to be able to really listen to most of it - subscription services is a good thing. I don't really have a strong opinion over subscription or paid music but I think it is important to let both markets live on. It's not everything if Apple decides to stop selling music - it is quite understandable since they are engaging in the streaming industry and they do it very successfully. Apple doesn't have to do everything, Amazon or any other places that sells music files will do - I think. Well, I just played a CD I purchased in 1984 and it played fine. I'm not sure how you define practical, but the fact that a CD always has a bit rate of 1,411 kbps and most downloaded or streamed song is 320 kbps or under, and the fact that CD's are usually priced very closed to mp3's I would say they are very practical! Also in favor of the physical product, at least in Japan there is typically a limited edition bonus of a DVD with music videos or selections from a concert, or an extra CD with music not available anywhere else, or other things. This adds a lot of value for me! This best-of CD has a bonus CD and bonus DVD! Is she the chick on YouTube that licks everything ? 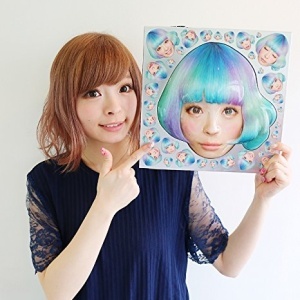 This is Kyary Pamyu Pamyu. I have never seen her lick anyhting in any of the music videos or concerts I have of her. That seems very much not like her. I have to admit of not watching many YouTube videos though. I sure hope its not her!!! Well as I grew up with different mediums the pc was one thing and playback or recording of music another. So by default I needed certain products to play certain mediums and eventually by accident it became old school B&O taking the interest, time and space. Having settled since 2003-2006 on Beosystem 6500 and 6000 I have what I need and it works for my needs. I really do not listen to music in head phones on the go by smart phone or the like. The craftmanship and high quality build of old B&O makes better sounds in my ears than getting the latest phone or streaming device. Even when it comes to cassette players/aka Beocords. With the stuff available today you got great choices for music enjoyment and old B&O is an area and lifestyle that is special. I just enjoy where I am. I am not looking for another medium option as it is. Except i use spotify as a useful 'on the go' facility... great in the car, at work, when travelling etc..
King St was lucky to get a Spotify invitation membership back in the day forst UK dealer with one, I believe) in, maybe, 2004 or 5, and iI've used it ever since. At home, we have the £15 account - and 5 of us use it a lot. Which i think is good value. CD's and vinyl for home use, Spotify out and about.. it works well. I know the artist reservations - but many of my preferred artists just use it as a way to sell gig tickets and (at the gigs) hard copies - and in that respect it works well. You would have to be a very big artist to generate a full time income from streaming listens alone.